Show off your next big idea to larger groups of 100 or more people. The PJ WXL6280 combines projection with digital light processing (DLP) technology to light up the screen. The result? 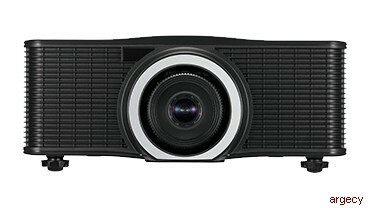 You get crisp images and videos in widescreen format, with 6,000 lumens of brightness and 1280 x 800 dpi resolution. You're sharing the same message to everybody in the room, so make sure they're seeing the same thing. Choose from five interchangeable motorized lenses and project presentations, images, spreadsheets and videos on screens from 50 inches to 300 inches diagonally, regardless of where you mount the system. Need more flexibility? Take advantage of 360-degree projection on any surface in the conference room or auditorium, even the floor and angled walls, to share more information more ways. The PJ WXL6280 is ready as soon as you are. Project your images with brilliant clarity and maximum brightness the moment you turn it on. Turn everything off just as quickly, with significantly less noise and distractions than lamp-based projection systems. And with no lamp to change or filter to clean, you can enjoy up to 20,000 hours of maintenance-free laser light illumination for stress-free presentations.